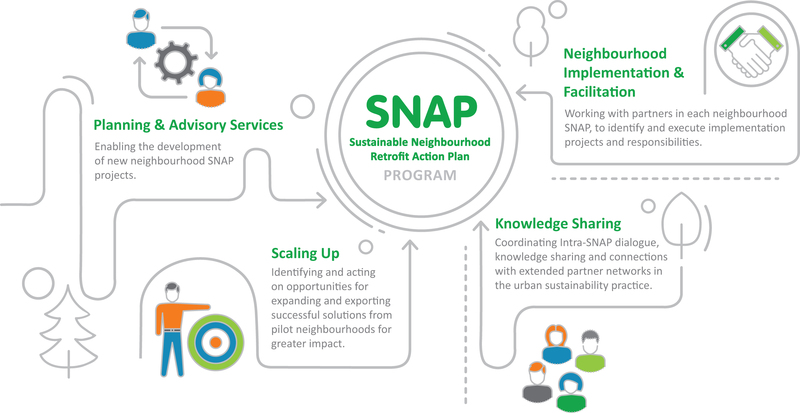 The SNAP Program aims to accelerate the creation of sustainable neighbourhoods in older urban areas by providing a neighbourhood-based solution for achieving greater impact in urban renewal and climate action. Toronto and Region Conservation Authority (TRCA) provides planning and advisory services, enabling the development of new SNAP plans within and external to TRCA’s jurisdiction. SNAP is developing a municipality-wide neighbourhood screening process to identify areas of aligning urban renewal and climate action priorities, supporting early collaboration and maximized co-benefits of ongoing projects. Fletcher’s Creek SNAP, Brampton: TRCA is advising Credit Valley Conservation on the development of its first SNAP. New SNAPs: Discussions are underway with a number of new municipalities and community organizations interested in contracting TRCA’s planning services in the development of new SNAPs. TRCA is advising GreenUp in the development of two SNAPs in Peterborough in collaboration with the municipality, Otonabee Region Conservation Authority, and other partners. TRCA works closely with partners in each neighbourhood SNAP to identify strategic implementation projects and responsibilities. TRCA’s role ranges from providing support to an implementing partner to leading multiple implementation projects and ensuring coordination among them. Home retrofit programs delivering on multiple objectives through locally tailored one-window approaches that foster neighbour to neighbour connections (West Bolton SNAP, Caledon; Bayview Glen SNAP, Markham; Black Creek SNAP, Toronto). Stormwater management pond retrofit design to provide improved water management and supply local irrigation water as a public-private win-win (County Court SNAP, Brampton). Community animation and leadership in community resilience (County Court SNAP, Brampton, Black Creek SNAP, Toronto). Suburban park renewal as a new model for integrated infrastructure renewal and catalyst for community engagement in home retrofit action (Bayview Glen SNAP, Markham and County Court SNAP, Brampton). Multi-unit residential (MUR) revitalization through partnerships with private landowners, tenant engagement, community groups and the municipality, using multi-functional designs (Black Creek SNAP, Toronto; Burnhamthorpe SNAP, Mississauga). Capacity building for local social enterprise (Black Creek SNAP, Toronto). Streamlined SNAP Action Planning (West Bolton SNAP, Caledon). TRCA facilitates intra-SNAP dialogue, knowledge sharing and connections with extended partner networks in the urban sustainability practice. Advancing Integrated Infrastructure Renewal: Lessons learned about barriers/enablers of innovation and recommendations from a process evaluation of SNAP projects. SNAP training at FCM’s 2018 Sustainable Communities Conference. TRCA seeks to identify opportunities for expanding and exporting successful solutions from pilot neighbourhoods for greater impact. Expansion of the Harvest the Rain home retrofit program to Rexdale, another neighbourhood having similar characteristics as Black Creek SNAP. Success of this pilot expansion suggest potential scalability to 89,000 homes in the Toronto Region. San Romanoway Towers revitalization project: discussions are underway with prospective partners about the potential application of this approach with other towers.